Relay for Life 2008 campain (cancer research) in Second Life ends this weekend after 4 months of fundraising and 160.000 (real) us$ made. Celebration will be in 35 sims with amazing builds. 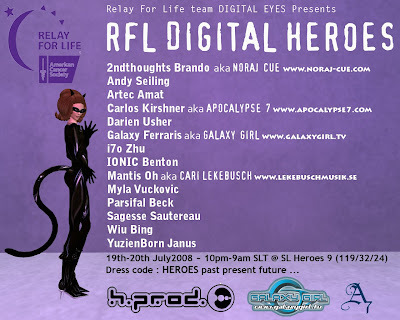 The team Digital Eyes organises a rave party at Relay for Life. From house to hard techno via trance, electro, minimal. DJs sets and live acts this saturday19/sunday20 July 2008 from 12pm to 9am SLT. 2ndthoughts Brando, Andy Seiling, Artec Amat, Carlos Kirshner , Darien Usher, Galaxy Ferraris aka GALAXY GIRL, i7o Zhu, IONIC Benton , Mantis Oh aka CARI LEKEBUSCH, Myla Vuckovic, Parsifal Beck, Sagesse Sautereau, Wiu Bing , YuzienBorn Janus are in charge to make you dance.